Qigong – also sometimes written Chi Kung/Chi Gung, Qi Gong – is a Chinese movement and meditation system. Its sets (sequences of exercises) can partly be traced back about 1000 years, but the term „Qigong“ as a generic term for health and strengthening exercises was not coined until about 50 years ago. Around the same time Qigong became widely known and practised in the western hemisphere. So what is Qigong and how can this internal art enrich our daily life and further our well-being? The Chinese term Qigong (simplified Chinese: 气功; traditional Chinese: 氣功; pinyin: qìgōng; Wade-Giles: chi gong) consists of two characters – „qi“ and „gong“. Qi is the Chinese term for life energy, which is thought to flow through the body. It can also be translated as breath, air, internal power or vitality. Gong means work, nurture, practice or cultivation. Put together as Qigong, both mean cultivation of life energy. Qigong as a system to cultivate life energy focuses on nourishing, strengthening or balancing the qi. Depending on the aims and the individual condition of the practitioner the Qigong exercises vary from very simple basic exercises to complex sequences. Qigong practice has always been health related. First documents about „Yangsheng“ can be dated back to the 3rd century AD. The notion of Yangsheng decribes the nurturing of life, the harmonisation of the circulation of Jing, Qi and Shen (matter, energy and spirit). Before the term Qigong was established as an umbrella notion for Chinese health exercises, these were known as Yang xing, as nurturing practices comprising Yang sheng – practices that nurture the body – and Yang shen – practices that nurture the spirit. While the influence of Daoism tended to emphasise the meditiative aspect of the spirit (Yang shen), the joint Daoist-Buddhist heritage of Qigong follows an integrative approach and gives the nurture of body and spirit the same attention. Qigong exercises are mainly characterised by flowing movements, deep breathing and a meditative state of mind. There are many different approaches, standing exercises can be found alongside seated variations, still Qigong with little or no outer movement can be contrasted with moving Qigong. The execution of the movements ranges from slow and gentle to vigorous and martial. Due to this variance in bodily requirements, Qigong exercises are generally suitable for people of all ages. They can be used to strengthen the body after an illness as well as for preventive purposes. Certainly the most famous Qigong set is the „8 Brocades“ (ba duan jin – 8 Treasures). This set is easy to learn and said to promote general well-being. The 8 Brocades work by coordinating movement and breath while associating each movement sequence with its positive effects on mind and body. The six sounds are meant to work on the six (five plus one) organs of the body, making energy and blood circulation strong and letting meridians Qi flow, reinforcing weak organs and calming organs which are too full. The key to Liuzijue is finding in time our personal way to harmonize movements, breathing, sounds emission and body consciousness, it is the way we perceive and listen-interact with our inner organs and body. In the end during practice there will be no me and no sound, we will be plunged in a flow, in which we are floating and body, mind and spirit will be one. See also our instructions with videos on the Six Healing Sounds! Another popular Qigong set is Five Animal Qigong. It consists of five exercises in which each movement sequence is associated with an animal, which the practitioner impersonates. Different sets of Five Animal Qigong can be found which work with different animals, but all of them basically follow the same approach. Five animal Qigong does not only promote the balance and strengthening of the whole body by following the choreography. Concentrating on the animal in question at the same time, the mind is trained to be more flexible and creative by expressing its internal vision of e.g. a tiger or a dragon in the movement of the body. Practising long enough one would even be able to imitate and feel the elegance of the crane or the strength of the tiger. Special sets or single exercises are said to be especially beneficial for particular parts of the body, e.g. the eyes or the neck. Some sets are even developed to ease the problems associated with certain disease patterns or for the enhancement of bodily functions. One example is finger qigong, which is designed to interconnect brain and body. Though many Qigong practitioners claim to feel significant improvements concerning different ailments, some even maintaining that they felt positive effects right form the start, independent research on these healing aspect of Qigong does not validly support these accounts. Qigong therefore can be seen as a way to further bodily and mental well-being in a gentle and sustainable way. Serious and continuous practice can improve bodily fitness and enhance its flexibility, but at this stage it cannot be confirmed as an adequate substitute for conservative medical treatment especially for severe illnesses like e.g. cancer. Some practitioners report though that for them Qigong exercises had a positive influence on tinnitus, cardiovascular diseases and chronic illnesses as well as Parkinson’s disease and multiple sclerosis. See also our article Qigong and healing. Although some of the more traditional Qigong sets are commonly associated with specific health benefits, it is rather the increased overall well-being, which is thought to be the main benefit of the regular Qigong practitioner. However, based on transmitted knowledge and skills new Qigong sets are constantly developed by health Qigong associations or medical qigong research institutes, which draw upon the theory of the meridians and the application of traditional movement principles. Some of these newly created sets are designed to serve a special health purpose by laying their special focus on the mobilisation of the body or taking into account their practicability for elderly people. The medicinal benefit of these medical Qigong sets and their positive impact for certain disease patterns can – if at all – only be assessed in the long run. 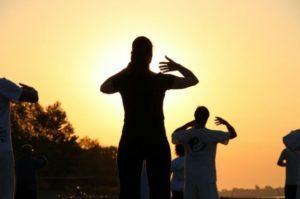 Qigong sets vary to such a degree that common principles or Qigong techniques seem hard to spot. One shared aspect however is the coordination of body, breathing and mind. Through regulated but relaxed breathing, the state of the body and of the mind is influenced positively: bodily tension and mental stress are reduced. Qigong has a long tradition with roots, which range from legendary times to medical, Daoist and Buddhist traditions. Those traditional lines of development provide a shared cultural context for the different variations of Qigong practised today. Several basic techniques or principles can be derived from these traditional lines. The underlying meridian system of Qigong forms part of the medical tradition of Qigong, while visualisation, breathing and meditation techniques can be said to root in the Daoist and Buddhist cultural heritage. Virtually all Qigong sets work on the basis of the system of meridians which forms part of the traditional Chinese medicine (TCM). Qigong is one of the five pillars of Traditional Chinese Medicine. The other four pillars are herbal medicine, acupuncture, massage techniques (Tuina) and dietetics. As a part of Traditional Chinese Medicine, Qigong is used for prevention of illnesses as well as for curative purposes. The Meridian System is the basic model of energy flow in Traditional Chinese Medicine. Meridians are paths through which the life-energy is thought to circulate. If they are blocked by tension or stress, ie if there is an imbalance of yin and yang, the bodily well-being is reduced, which can eventually result in restriction of movement of the joints, hardening of or tension in the muscles or bodily pain. Removing these imbalances and reestablishing the equilibrium of yin and yang is the main object of Chinese Massage (Tuina), but there are also special Qigong sets, which concentrate on the stretching of the meridians to enable the body energy (chi) to flow again. 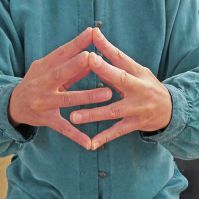 Another Qigong technique often found is the technique of visualisation which can take different forms. In an easy way of visualisation the practitioner visualises a positive picture associated with a certain movement or a certain position, e.g. „standing like a pillar“. This type of visualisation helps the practitioner to get away from the outer, bodily aspects of Qigong towards a more internal approach. There are also visualisations that work with concepts going beyond the body, e.g. visualising the body (human) as moving between earth and sky or the idea of letting a beam of light shine out of the palm of both hands. Exercises like „rooting like a tree“ work with the idea of extending both feet deep into the earth. More complicated ways of visualisation involve ideas like moving or leading the energy (qi) through the body. Some Qigong exercises focus on leading the energy along the meridians, which first of all is a technique that helps focusing the mind. The ability to lead the qi or to feel blockades can be attained after a long period of dedicated and supervised learning. It therefore depends on trained bodily consciousness and should not be confused with willful, mind-controlled evocation of strong images or a deep belief in supernatural powers. 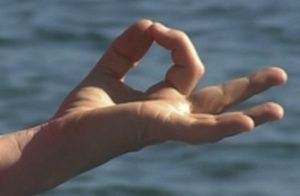 Qigong breathing techniques are mainly influenced by daoist meditation practice. The different breathing methods are thought to connect the practitioner to the universal qi (external life energy), which is transformed into internal qi in the breathing process. Thus the cycle of breathing consists of two parts: one positive part – breathing in fresh air – and one negative part – breathing out used air. In Qigong the natural breathing (normal, abdominal breathing) is complemented by the so-called reverse breathing, which is the classical Daoist Qigong breathing technique. The basic technique of tai xi – embryonic breathing – is designed to copy the breathing of the embryo in the womb. Embryonic breathing is in fact a combination of two techniques: stopping the breath (bi qi) and circulating it (Xing qi). This breathing technique physically increases the oxygen level in the body by a pressure-initiated massage of the inner organs in the lower abdomen and the thereby caused enhancement of blood circulation. The Qigong breathing technique of tai xi is the original main breathing technique of Ba duan jin (eight brocades). Other breathing techniques – Xing qi, Yang qi, Bi qi, Ta gu na xi, Fu qi, Lian qi, Tiao qi. Virtually all Qigong sets have an element of meditation. Most of them combine meditation with movement. Lying and seated Qigong sets which form part of the so-called „still“, i.e. non-moving, Qigong come closest to related meditative practices as e.g. daoist or buddhist seated meditation. As in other systems of meditation, some Qigong sets even work with sounds or the voice of the practitioner. Over the last decades the term Qigong became widely associated with exercises of health and meditation. If one uses Qigong as a generic term, Taijiquan as an internal Chinese art would be a special kind of Qigong. Contrasted to Qigong as a health exercise, Taijiquan is considered to be more complex. One traditional Taijiquan form (set) can easily comprise a series of over 100 movements. 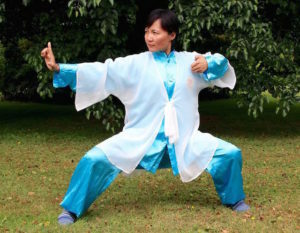 Although Taijiquan and Qigong are both internal arts and both involve meditation in movement, the main difference between Taijiquan and Qigong is the aspect of self-defence, which is missing in Qigong. The same movements of Taijiquan that are indicated slowly in the form are – at a much accelerated tempo – applicable for self-defence and boxing, for instance as punches, throws or blocks. As a martial art Taijiquan knows different patterns of partnerwork as well as weapon forms. 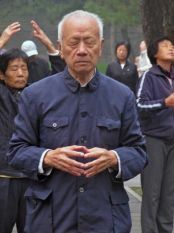 Neigong, which as “internal work“ is a part of Taijiquan training as well as of other internal martial arts, uses “Qigong“ techniques to built inner strength. Martial Qigong is a variety of exercises, which form a part of martial arts training. The different aspects of martial Qigong traditionally cover exercises to increase bodily resistance and strength in general as well as exercises to increase martial abilities and conditioning exercises. There are also variations of „normal“ Qigong sets thought up to develop the musculature and strengthen the tendons to make them more flexible. Martial qigong can thus be an addition to a martial arts training which focuses on applicability or the preparation for competitions and tournaments. These martial types of Qigong form part of neigong – the inner work of Qigong. The most well-known and almost mystic form of neigong exercises is iron shirt Qigong, which – if practiced in the right way and long enough – is thought to make the body strong enough to take any blows. It is commonly associated with the highest possible accomplishment in martial arts and the legend of the invincible warrior. In reality, iron shirt qigong consists of sets of rigorous, work out style and focusing exercises, which slowly build up specific bodily functions which have to be connected to a certain mindstate (mental training of the yi – intention). Although the hardening of the body may also serve in combat situations, these skills can be most visibly demonstrated in competitions as well as in popular shows or (religious) rituals. Any other claim to a special neigong skills solely accomplished by mental exercises like meditation or chi connection without bodily training aspects should be approached with caution and a critical mind. All practises are health giving as the various forms and routines are designed to work on specific acupoints and key meridians to regulate and balance the flow of the internal energetic system or Qi. Although the term ‘Qigong’ is relatively new it was created to encompass a range of practices designed to optimise the body’s natural healing energies. Qi = Energy and Gong = work/cultivation/exercise. Medical Qigong is a term applied to the use of qigong as a healing modality. By combining a knowledge of Traditional Chinese Medicine and its energetic system with specific exercises or energy transmission the Doctor or Healer will work, in conjuction with the patient to optimise the body’s natural healing energies. Scientific Studies Scientific studies about the efficiency of Qigong face a double challenge. For one thing, the cultural background of Qigong leads to a specific view of the human condition, which in part conflicts with the Western view on the human body, which lies at the foundation of “modern” medical research. An additional problem is that scientific standard methods of medical research, which determine today’s Qigong research, are to some extent unsuitable to capture typical aspects of Qigong, due to the Western image of medicine and its rootedness in a distinct research tradition. Cancer Healing I have been a practitioner and teacher of Qigong (Yangsheng) for many years. In the scheme of things I am reasonably well qualified and have a great deal of experience. For the past few years I have been teaching Qigong professionally to cancer patients at a Maggie’s Cancer Care Centre. I can tell you categorically that I do not teach Qigong to cancer patients in order to cure their cancer. Claims of curing cancer with Qigong are not only bold but dangerous and irresponsible. They prey on the vulnerable and desperate. Even the more well known ‘cancer curing’ Qigong methods like the Gui Lin Walking Qigong has no real scientific basis for claim. What is Tai Chi Chuan (Taijiquan)?